When you can only have a few items available to bug out with, it is important to know that those items can be useful in a variety of scenarios and situations. Tools that have multiple uses are especially important to consider. 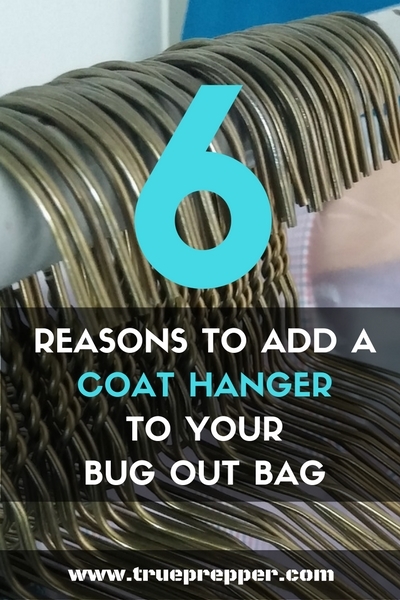 A simple wire coat hanger can offer plenty of functionality to warrant it’s inclusion in your bug out bag. One of the more well known uses for a wire coat hanger is to be able to jimmy car locks open. Whether you are going in between the window and door seal in an older car, or prying the top open and fishing the wire hanger down to pull the lock- the key tool for both methods is the wire coat hanger. Whether you are getting into your own car or scavenging other cars in an emergency, packing a coat hanger just for this reason maybe reason enough. Handling hot objects is not something you want to do bare handed. Whether you are boiling water or cooking over a fire, a coat hanger can make the job much easier by providing a sturdy tool with reach. Whether you are using it as a simple fire poker or fashioning them into a set of tongs with a piece of elastic or rubber band, you will be glad you had it with you. If you plan on cooking with a hanger, make sure to remove any paint that may be on it to avoid toxic fumes. Clipped and bent wire coat hangers make great makeshift ALICE clips. If you need to carry more on the outside of your pack, trimming your coat hanger to bend a few gear clips can free up your hands or room inside your pack for more carrying space. Had to include the obvious. Whether you are hanging clothes or other gear to dry or for organization, a clothes hangers main use is still practical in an emergency situation. Dry clothing and equipment is very important for survival, and a simple hanger can help you dry equipment very quickly. Trim a little off of the coat hanger and sharpen one end. Bend the other end in a tight oval loop, and you have a large makeshift needle. It can be used for rough clothing repairs or to stitch large textiles together, such as tarps. 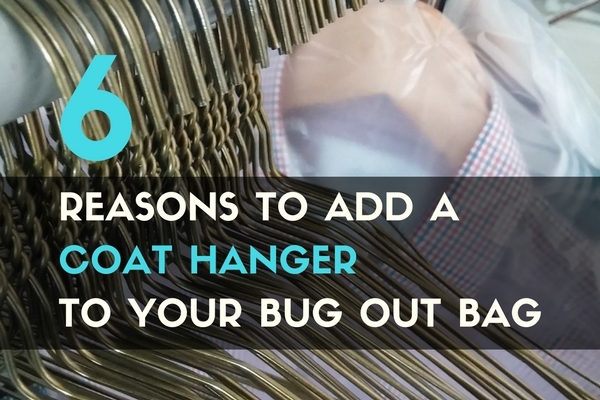 Do you keep a coat hanger in your bug out bag or get home bag? Many preppers opt to keep survival wire that is not as stiff in their kits. While this wire is much better for snares, traps, and a few other uses- it does limit its functionality on most of the reasons list above for coat hangers. While the survival wire may truly be the better option, almost anyone has a wire coat hanger already available in their home- and they are easy to add in case of an emergency bug out. Let us know what wire, if any, you keep in your kit! Keep exploring, stay prepared, and be safe. ← How Will You Communicate in an Emergency? Man, I need to get some wire hangers. Mine are made out of wood. Who knew coat hangers could be so versatile! But that’s the thing, isn’t it? Being prepared for any survival situation is all about learning how to think outside the box, improvise, etc. That’s why I love reading posts like this–you get great ideas that really inspire you to think about everyday objects in a new way.